Magnetic wands are great for introducing students to the wonders of magnetism. 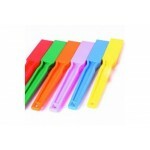 Each wand contains a permanent magnet moulded into the end of a brightly coloured plastic handle which is durable and easy to clean. pack 6 .. This giant horseshoe magnet is plastic cased and a great choice for young children. It is large, safe and powerful. It can be used for numerous general magnetic experiments. ..